Mountain Housing Opportunities (MHO) in Asheville has been recognized as a NeighborWorks Green Organization for its comprehensive commitment to sustainable operations. To achieve this designation, MHO was required to demonstrate adherence to a set of green business practices across its operations and all of its program areas. This is the fourth consecutive year that NeighborWorks America has recognized member organizations for their efforts to create healthier, energy-efficient environments for homeowners, renters, community residents and employees. To date, 81 NeighborWorks organizations – or nearly one-third of the network – have achieved this designation. MHO mission is to build and improve homes, neighborhoods, communities, and lives, and build hope and dignity in the people they serve. Mountain Housing Opportunities is committed to green practices. MHO’s Community Investments Department developed the Glen Rock Depot, a LEED Gold mixed-use building with 60 apartments and over 9,000 square feet of ground floor commercial space. All of the 32 new single-family homes built by MHO’s Self-Help Homeownership department meet GreenBuilt NC,a state-wide green building standard. MHO’s Emergency Home Repair division also uses the GreenBuilt NC’s energy and water efficiency standards when selecting new equipment,fixtures,and appliances. NeighborWorks America, which creates opportunities for people to live in affordable homes, improve their lives and strengthen their communities, supports a network of more than 240 nonprofits, located in every state, the District of Columbia and Puerto Rico. The 81 NeighborWorks Green Organizations together own more than 59,019 affordable apartments and have built or rehabilitated more than 3,164 green rental and for-sale homes in the past two years. Through the organizations’ participation in this program, 5,515 employees are experiencing a healthier, greener working environment. Last year, they educated more than 14,885 households seeking to purchase or owning a home on the core elements of healthy and sustainable homes. MHO is a private, nonprofit, community development corporation. Founded by volunteers in 1988, the organization’s first task was to repair the roof of an elderly widow living in Leicester, NC. That repair was the beginning of MHO’s Emergency Home Repair program, which now repairs the homes of over 150 low-income homeowners each year — all elderly, disabled, or families with small children. Today MHO is the largest and fastest growing producer of attractive, affordable homes and safety-related home repairs in western North Carolina. In its 27 year history, MHO has grown from a part-time volunteer effort to a full-time organization of professionals, subcontractors, volunteers and supporters. Its services include: Emergency Home Repair & Rehabilitation, Affordable Homeownership Development and Lending, Community Rental Investments, and Neighborhood Revitalization. In its 27 year history, MHO has served over 5,700 households. MHO currently serves over 800 households each year. 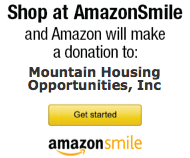 For more information about MHO, visitwww.mtnhousing.org or call 828-254-3030. For 35 years, NeighborWorks America has created opportunities for people to improve their lives and strengthen their communities by providing access to homeownership and to safe and affordable rental housing. In the last five years, NeighborWorks organizations have generated more than $22.5 billion in reinvestment in these communities. NeighborWorks America is the nation’s leading trainer of community development and affordable housing professionals.